Dai Lai Golf & Country Club located at the foot of Tam Dao Mountain Range and on the banks of beautiful Dai Lai Lake in the suburbs of the Viet Nam’s capital, only 40km away from the inner city or just 10km from the International Noi Bai Airport. Dai Lai means “a great source of water” in the language of the San Diu ethnic group who reside near the lake. The 525 ha hand-made lake and surrounding areas have diverse terrain including charming lakes, hills, valleys, and mountains. The climate and weather in Dai Lai are rather stable thanks to the surrounding mountains. The average temperature is 28oC (82oF) in summer and 16oC (60oF) in winter, more comfortable than Ha Noi and neighboring regions. 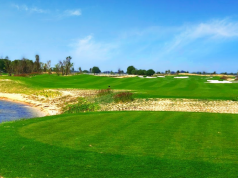 Since 11/2010, Dai Lai Star Golf & Country Club is officially open for business and has heralded a new golf destination in the North of Viet Nam. 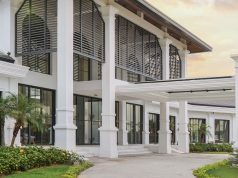 Designed and built by Peter Waddell, who has over 25 years’ experience and has earned a reputation for reliability and quality golf course construction in Southeast Asia. The 18-hole golf course is stretched over 298 hectares of land that nature did a great job of landscaping before the designer arrived. To his credit he used the natural feeling of nature to create a magnificent golf course, each hole of the course playing along the shore of lake with some small lakes in the middle of the course and many water hazards, all of it together to make a real challenge to any golfers. The rolling terrain provides dramatic elevation changes on many of holes, additional, the undulating greens and fairways are kept in immaculate condition but they rarely offer a flat lie that will challenge even the championship golfer. As the number of players continues to increase, more and more stress is placed on the grass and on the superintendents to maintain playable conditions on golf courses. Dai Lai Golf Club adopts a changing policy that change the playing area frequently to create new dramatic challenges for golfers. In addition, the field also has a bar, auxiliary facilities and a large parking lot with a capacity of about 50 units. The awe-inspiring scenery mixed with the exquisite architecture create an ideal romantic getaway from the hustle and bustle of Ha Noi and very suitable for meetings and entertainment. Address: Ngoc Thanh, Phuc Yen, Vinh Phuc, Vietnam.